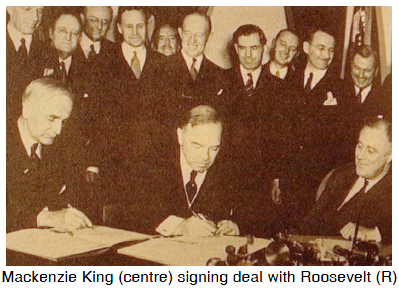 If World War I was crucial to Canada's coming of age as a country, World War II was the beginning of a slip into continentalism: political or trade agreements binding countries within a single continent, in this case, Canada and the U.S.continentalism. Prime Minister Mackenzie King had been in power during most of the years between the wars except for Arthur Meighen's brief tenure and R.B. Bennett's unfortunate timing, serving his only term during the first grim years of the depression. conscription: the compulsory enlistment of men into the armed services by an act of law.conscription crisis of the First World War. He was determined not to repeat it. Trying to juggle the demands of the war while keeping the country intact and Quebec in support of the Liberal party, tested King's political talents to the limit. Late in 1940 he made an agreement with the American president Franklin Delano Roosevelt, to form a Permanent Joint Board on Defence. This was done, surprisingly, without benefit of a cabinet: a group of advisors chosen by the Prime Minister from the majority party in the House of Commons.cabinet discussion or parliamentary debate. The agreement bound Canada to a continental defence policy with the United States. To compound this he signed the Hyde Park Declaration in 1941 which bound the two countries economically to buy war goods from each other. These agreements seemed reasonable at the time, but in retrospect they took Canada out of the British fold, only to tie us to the Americans. plebiscite: a direct vote by the qualified voters of a country, province, etc. on some question.plebiscite to lift his earlier promise of no conscription. Again Anglo Canada resoundingly approved and Francophone Canadians rejected it. King was able to avoid a confrontation until 1944 when troop shortages were so severe that some conscripts had to be sent. King's solution was to ship 16,000 of the zombies: men who were conscripted for service in the army, but only for home defence. They were not originally to be sent overseas.zombies overseas. Quebec was not too upset and the war was thankfully ending. King had kept his Liberal party intact and in power. He had kept the Liberal stronghold of Quebec. All in all quite a feat for someone who spoke with his deceased mother. The war was a natural place for the federal government to increase its powers. Working on the recommendations of the Rowell-Sirois Report and dodging provincial objections with his usual political deftness, King began introducing national social programmes. Unemployment insurance was started in 1940 and the family allowance began in 1944, putting a cheque into the hands of all mothers every month. The War Measures Act was used again in World War II to give extra powers to the federal government and the new theories of Keynesian economics supported centralization with the idea that federal spending could be used to stimulate prosperity. 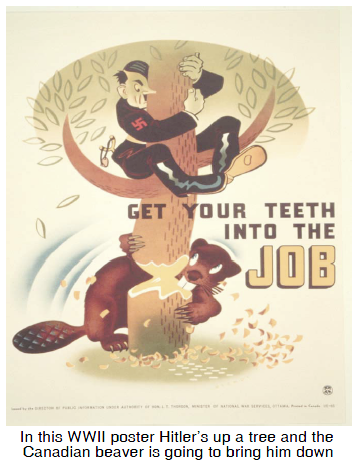 The bureaucracy in Ottawa grew from 46,000 employees in 1939 to 116,000 by the war's end.